With a range of rugged builds and heaps of features, Dell's Latitude series is geared towards mobile business users. The Latitude E6510 packs a huge amount of power and features into a reasonably solid chassis for excellent business performance. Power is provided by a quad-core Intel Core i7 processor with great results. We saw no slow-down when multi-tasking with several resource-intensive applications, and our every action was met with a speedy response. And this is despite a 32-bit version of Windows coming preinstalled, which doesn't take advantage of the 4096MB of DDR3 memory. 3D performance comes courtesy of an Nvidia Quadro NVS 3100M graphics card optimised for professional design work. While multimedia business applications run smoothly, there's not enough power for more recent games. Creative designers need a sharp screen and Dell has expertly delivered a 15.6-inch Full HD (1920x1080) display. Not only is it perfectly crisp, it's pleasingly bright for those lengthy work sessions. Photos and video look fantastic and it's a shame there's no Blu-ray drive for watching HD movies. Usability is strong, with tapered keys filling out a well-sized backlit keyboard and an excellent touchpad with individual scrollbar sections for quick browsing of documents and web pages. A pointing stick commonly found on business laptops is available as a touchpad alternative with its own set of dedicated mouse buttons. The chassis isn't too heavy at 2.9kg and should comfortably fit in most briefcases. Overall, it's a well-built machine, although there is some flex around the speakers and the right side of the laptop. We managed 195 minutes of use away from the mains which is commendable considering the power on offer. Features are another strong point. PC Card and ExpressCard slots can be used to attach peripherals, along with four USB ports, one of which doubles as an eSATA port for speedy transfer with external hard drives. External monitors can be hooked up via VGA or DisplayPort, while a Smart Card port boosts data security for businesses that support it. Our only complaint is the measly 250GB hard drive, although file transfer is fast at 7200rpm. 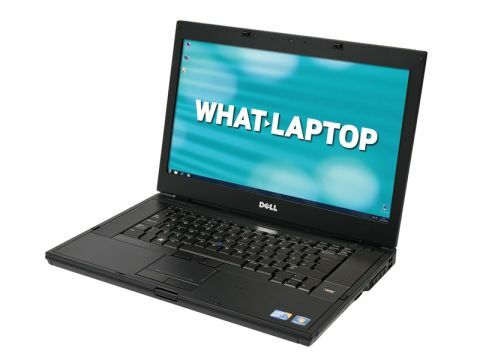 Dell has also included its basic Latitude ON operating system, which can be accessed using a quickstart button. This is designed for simple tasks, such as web browsing, and uses less power than the Windows OS. We were highly impressed by the power, features and excellent display offered by the Dell Latitude E6510. Business users with the cash to spare really have no need to look any further.